Good news! We have extended the 2019 PanelPicker® entry period through the weekend. Take advantage of this extension and get your session proposals in before the final deadline on Sunday, July 22 11:59pm PT. Use this time for last-minute tweaks to your speaking proposals for the 2019 SXSW Conference, SXSW EDU, and SXSW Gaming. With so many PanelPicker® proposals, how can you ensure that your amazing idea stands out? This Friday, July 20 in the deadline to enter your session ideas for SXSW 2019. Dive into our helpful PanelPicker tips for constructing the perfect proposal and review the 25 Tracks of programming for the 2019 SXSW Conference. Follow the instructions and read the FAQ. Reading the PanelPicker FAQ will give you important information about SXSW and more valuable tips for creating a great proposal. Create a future-focused, original proposal that shows what you’re passionate about. Often SXSW previews what you’ll be talking about next year and beyond in tech, culture, music, and film. Give us your perspective on what lies ahead and why. Depth and specificity. SXSW attendees want advanced, in-depth information, so be sure to delve into the particulars of a topic. The more specific a proposal is, the better. Drill down to what really matters. Your title should reflect your description. Your title is going to be fighting for attention with hundreds of other titles in PanelPicker, so it’s important for your title to be direct and explanatory. The community should be able to understand what the proposal will cover without reading your description. Remember: think simple, accurate, and succinct. Tip: Avoid using ALL CAPS in your title and proposal. Diversity matters. All panels (3-4 person sessions) must include diversity in gender, race, location and employment of speakers, and diversity in thought and opinion. Include a video with your proposal. Your speaking abilities matter and we’d like to see them. No fancy production required – recording from your webcam or phone works just fine. Proofread, proofread, proofread. Did we mention to proofread? Spelling, grammar, and punctuation are extremely important. Once you have completed your draft idea and clicked “Enter My Proposal,” you will NOT be able to edit your idea. Be sure you have reviewed your proposal carefully. Meet the deadline. The final deadline for 2019 PanelPicker entry is on Sunday, July 22 11:59pm PT. 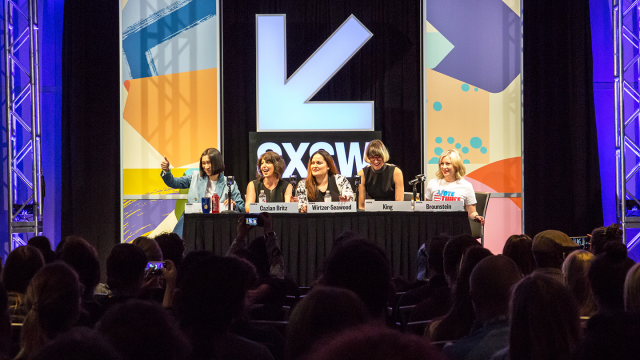 The SXSW Conference provides an opportunity for global professionals at every level to explore what’s next in the worlds of entertainment, culture, and technology within 25 Tracks of programming. Get to know our 2019 Tracks and discover which track best aligns with your session proposal: Interactive Tracks, Film Tracks, Music Tracks, and Convergence Tracks. While PanelPicker contributes to the majority of the 2019 SXSW Conference programming, it also helps us identify industry trends based on each season’s entries. Explore 2018 Programming Trends and follow SXSW News for the latest updates in trends that emerge from the 2019 PanelPicker®. Visit panelpicker.sxsw.com to login or create a new profile and then begin your proposal. Enter your speaking proposals for the 2019 SXSW Conference, SXSW EDU, and SXSW Gaming. All ideas received will be posted online for Community Voting from August 6-30, 2018.
Review the resources and tips to get started on your 2019 PanelPicker proposal and enter by the final deadline on Sunday, July 22 11:59pm PT. Good luck! Mark your calendars for August 1 when Registration and Housing opens for the 2019 SXSW season.